It’s been a while since I’ve made an update, sometimes life throughs a curve and you get onto the DL for 6 weeks. I’m back in saddle and have an update! So, about four years ago I purchased this kit. Knowing that I’d be relocating to Malaysia, I wanted to look into shipping times and have something to work on during my visits (twice a year for two weeks). The path I chose was Academy, as they are made in Korea, which is fairly close to here, and the inexpensive cost. This one shipped and arrived in about three weeks, costing just under 20 USD. Armed with new knowledge, I had a little project to keep my busy in the limited spare time. This also resulted in finding supplies, something that was scarce then, and now nearly impossible to get locally. Over the course of vacations, I made progress, but discovered that the Academy curse followed me! For a newer tooled kit the fit is less than banner, while some of the issues were self-induced, the majority were from the manufacturer. Making me wonder if anyone at Academy even tried to build the kit prior to going to market. Despite the fit issues, I was able to work on my filling and sanding skills. Following the move and armed with my tools, and a stronger arsenal of materials and supplies, this Queen had the wind at it’s back (not much of a wind but moving in the right direction). 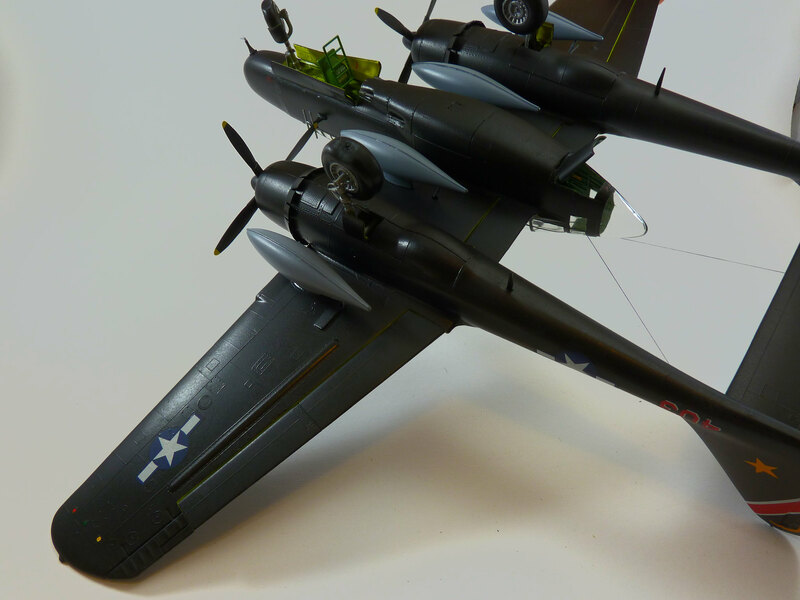 Tamiya, makes some wonderful products, and some real bombs. I picked up a tube of their UV hardening filler to use to fill some of the many gaps. This stuff, in my opinion isn’t worth paint on the label. It tended to harden once out of the tube, and when I was able to get onto the gap didn’t fill well at all. To further the frustration, it doesn’t sand well either. In order to get rid of the seam, I first had to surgically remove the stuff using a number 11 blade, lots of patience and many unkind words to the inventor of said stuff. I got it off and was able to fill the gap using Mr. Surfacer 500. This was an expensive adventure on what not to use. I cannot recommend it to anyone for anything. On the other hand, I picked up some of their flexible tape, and really like the stuff! I used it to mask the front of the canopy and in the course of about a minute the front portion of the canopy was done and ready for final masking. This was a huge time saver. Total masking time on the canopy was around 10 minutes. I was finally able to complete the airframe! Now a new adventure! Painting at the new place while not being completely set up. 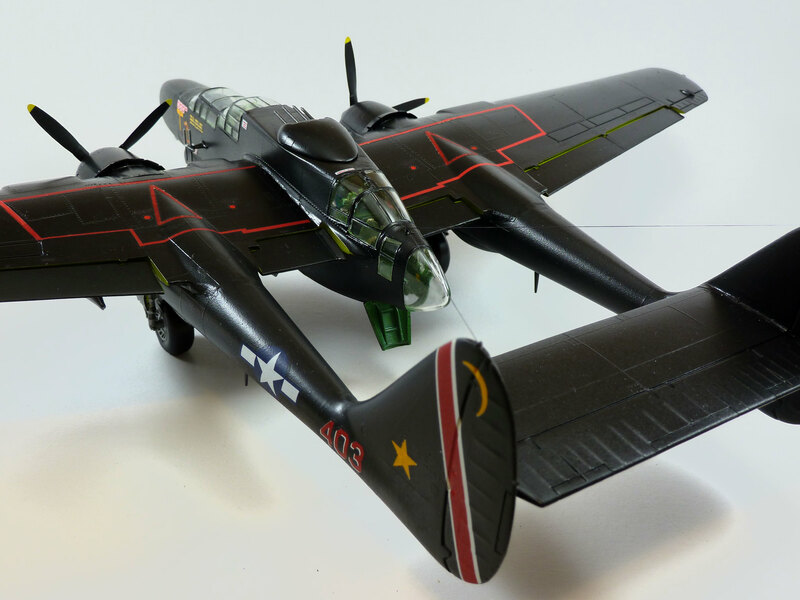 I laid a coat of Tamiya gloss black down as a primer and to check for any real glaring issues. 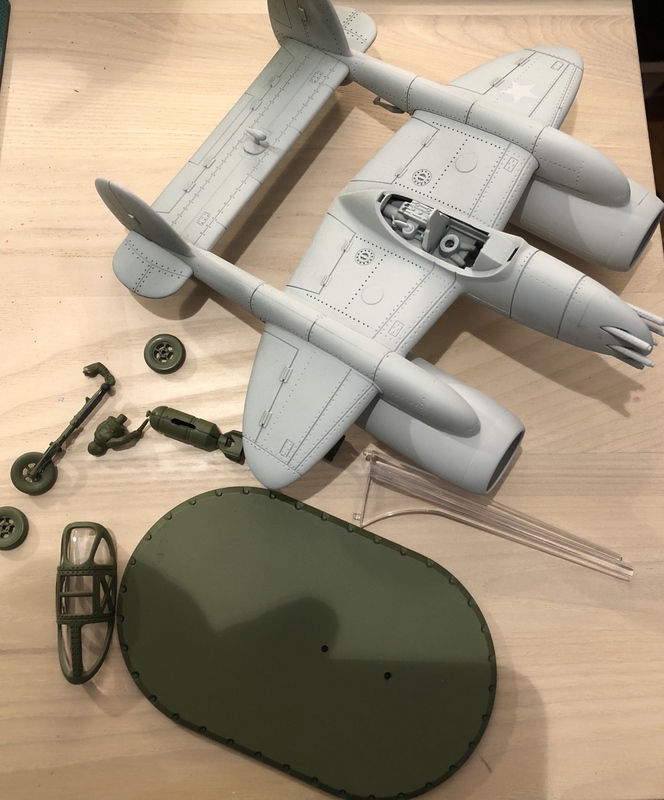 While this build will be a gloss finish, it has worn me out, so my re-work on the few sanding scratches the are present will be pretty much ignored. 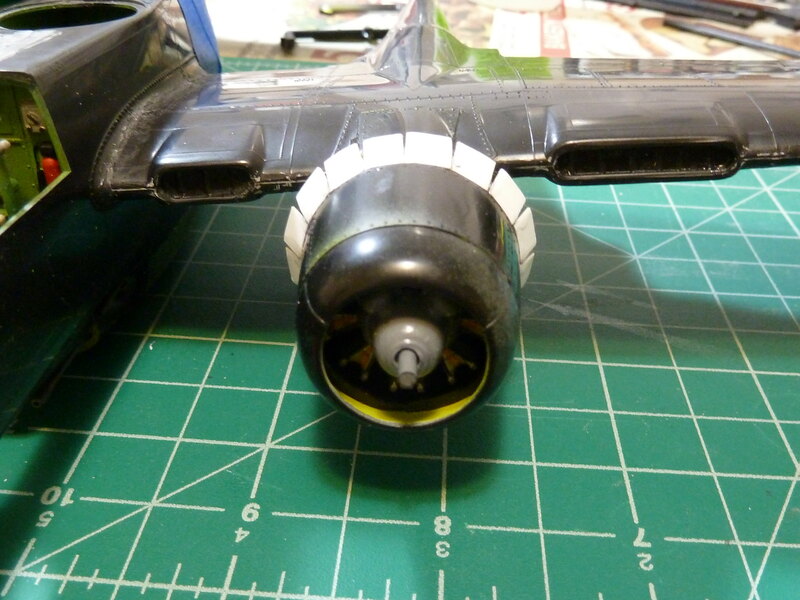 Attempted to fix the cowlings...as I said before, the left is in the closed positioned but the right is open. Since I'll be showing it on the ground at rest, I wanted both cowlings open. 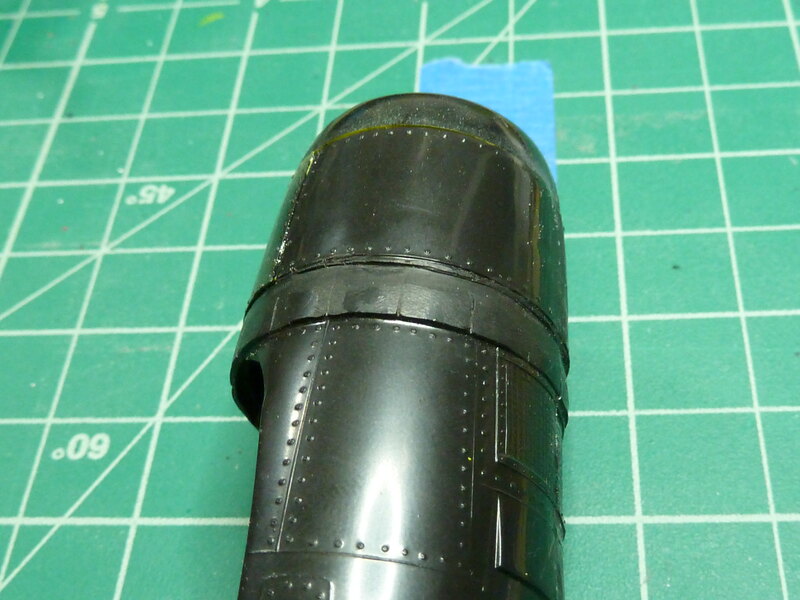 Step one was to diminish the left's surface detail and file a groove for the cowling flaps to sit in. This is one instance where I was glad for the kits extremely soft plastic! 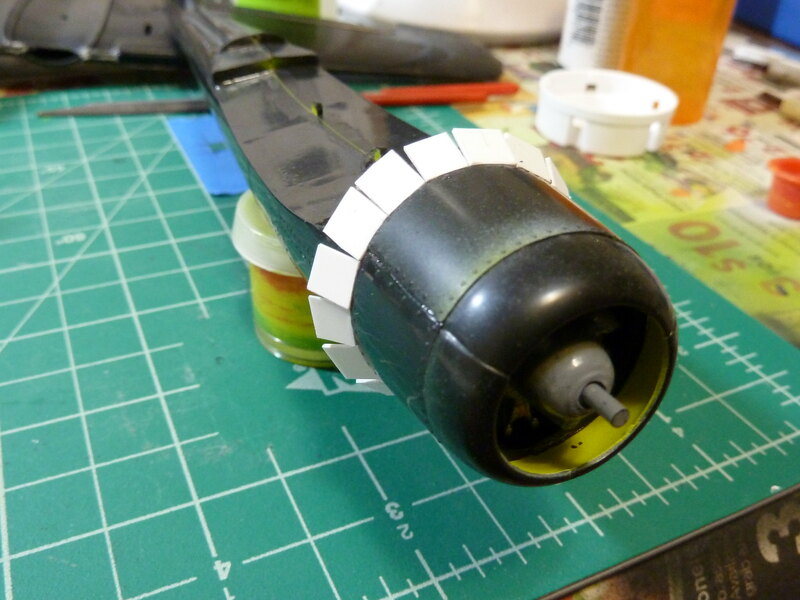 Step two: cut out a bunch of styrene squares and set them in place along the nacelle. Step three: sand around the whole thing multiple times over until it takes on a uniform cylindrical profile. Step four: put it all together on the fuselage and wings! Here is my entry, a Northrop T38 Talon in Boeing colours. I need to modify the leading edge of the wings to the T38 style from the F5 style. There is a slight difference, the F5 had a leading edge extension whereas the T38 did not. We're all still plugging along! Darrell, looks like something that can finish the line first! My Academy curse continues. Apparently, the nose on the F-16 wasn't secure enough for one of the nieces. For some unknown reason, all liquid glues wouldn't weld the damage. So, I resorted to Superglue! This was most likely a good thing, as it forced me to clean up the canopy mating area. So, all has been sanded and polished out, next up a repaint of gloss black, check for issues and continue on with the White Paint Job from Hades! This build is certainly testing my will. Due to the move I don't have a test bed and this bird keeps volunteering! All kidding aside it's not as bad as I make it out to be. I put some black paint on the F-117A. The top needs a bit more paint in places and some smoothing out. The bottom still needs some work around the gear wells. And then there is the tires; sooo tiny. 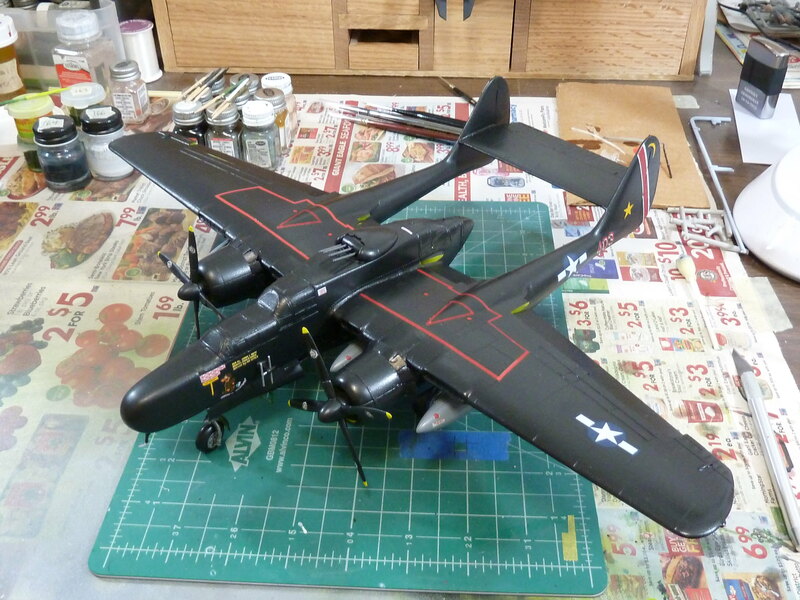 Work on the B-2A got stuck because of some confusion about the painting instructions, but I am over that. I was thinking about hand painting it, but I am tempted to break out the airbrush. I am going to get this bird done. The Pelican from the Dust 1947 game. 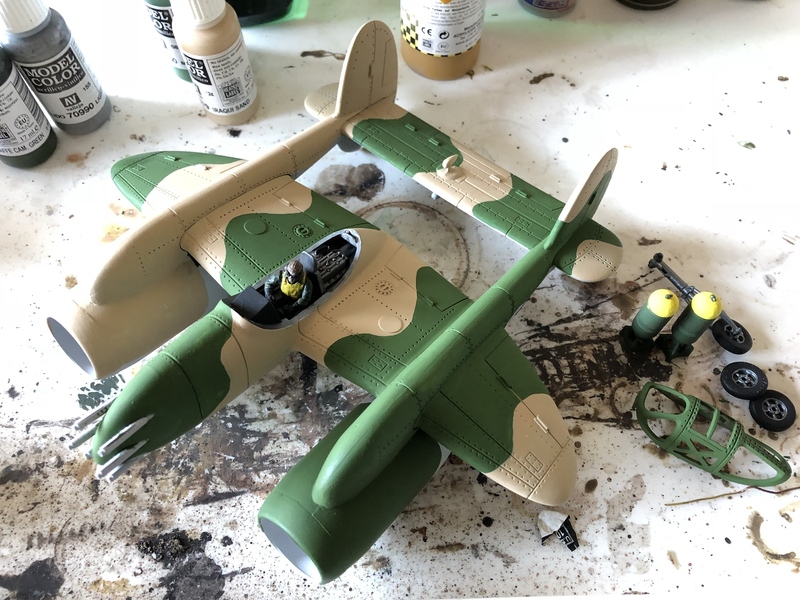 A little more progress on my Pelican fighter bomber. Pretty satisfied with the camo so far. Jesper, that is one very interesting model! What scale is it in? I mean, it's not really a plane is it? Goof, the spirit of the hangar queens is to get unfinished projects off the shelf of doom, and get them finished. It's partially built, and was intended to fly. So yes, it's in! Good luck!! 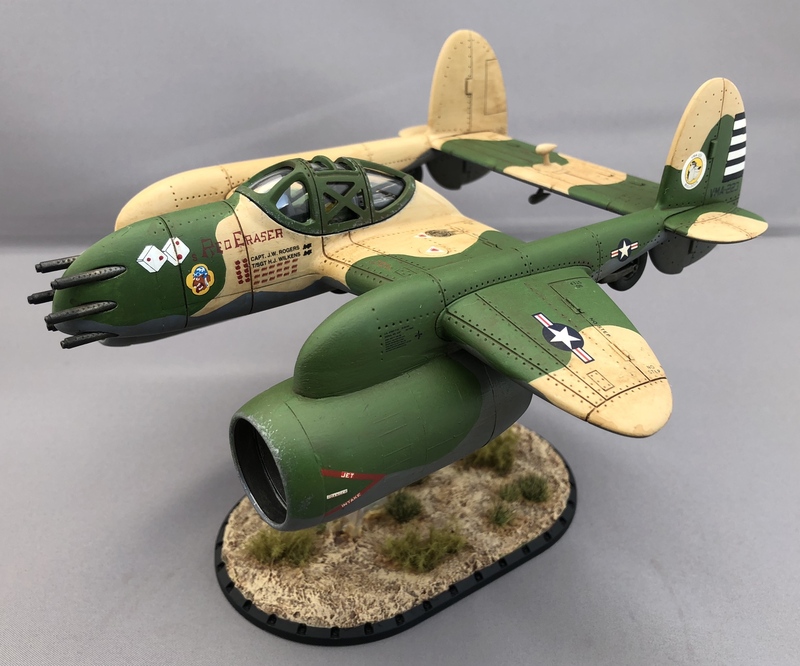 It is a Dust Tactics Pelican fighter bomber for the Dust 1947 strategy game. The scale is very close to 1/48, maybe a little bit bigger in some instances. Now it is ready for decals. More to follow. Three months later, I'm finally going to have this stupid kit built and on my shelf It got to the point where my standards got so low for this kit...the fit was difficult, the canopy was a birdcage that didn't mate, it ate a ton of paint, the decals were ~30 years old (and it showed), blah blah blah. It sat like this for a while because I just couldn't bring myself to remove the masks for fear of bleeds/tears/fogging. But tonight I finally worked up the courage and unmasked the Black Widow! For the most part, it worked out very well, nice clean lines and very few panes to fix up. We'll just ignore the MASSIVE fogging along the top canopy...thankfully, you really can't see it in this picture, but I honestly considered fashioning a storage tarp to throw over the canopy to hide the blemish.. This model pushed the limits of my lightbox. One of the many reasons I'm not a fan of larger-scale models. Robby, it is great to see one built up and to a high standard. 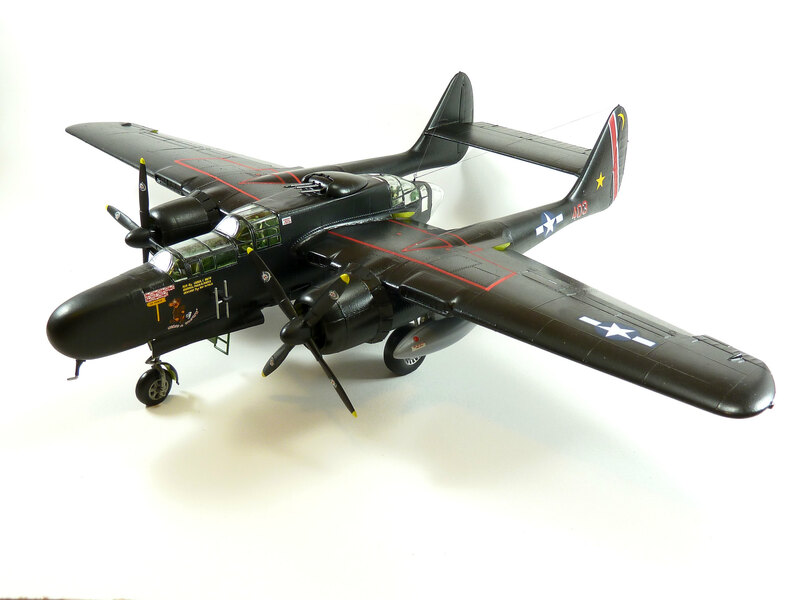 With this model STILL in production and on the shelves of every toy store in North America, and with its many and varied challenges, I have long held the opinion that this kit alone has done more to drive kids away from the hobby than any other! Full disclosure, I am not rescuing my 40+yr old version from my parent's attic any time soon! A well-earned ribbon! 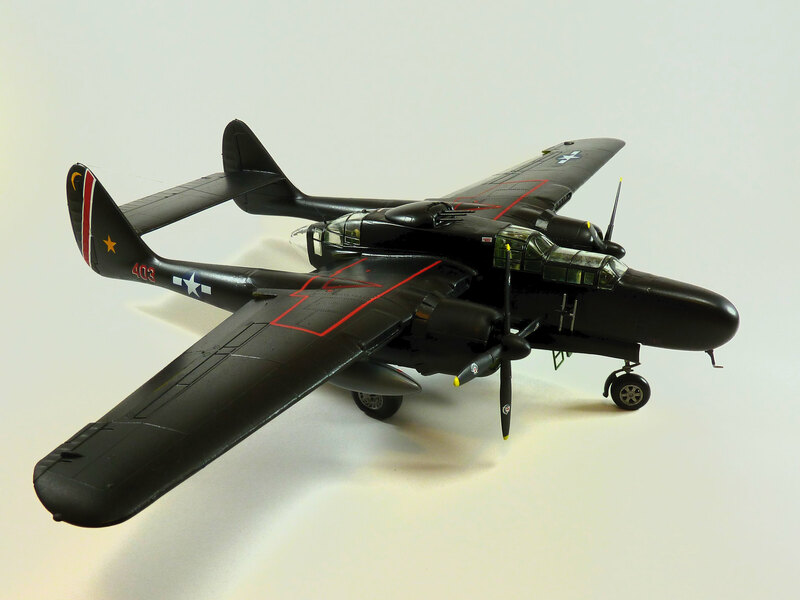 I have a Monogram's P-61, TBD, and Do 335 to finish as well. I completely agree with your assessment. 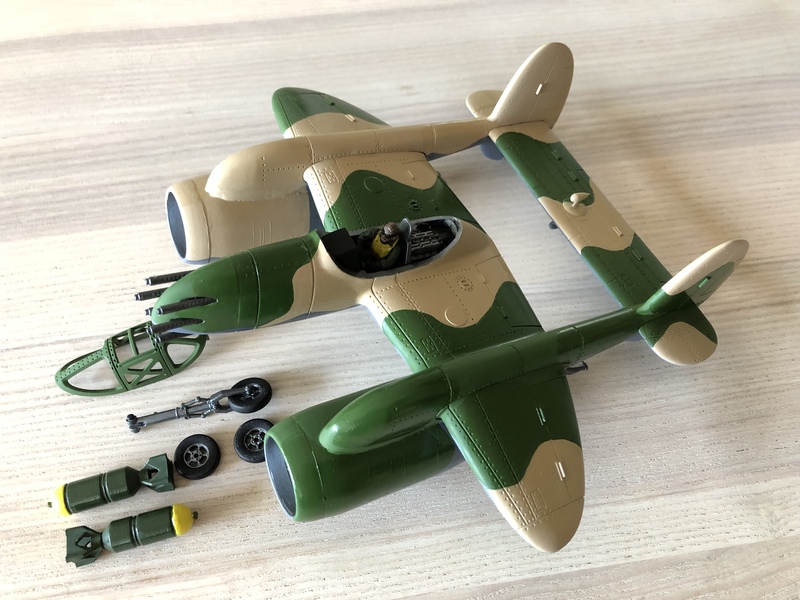 As a kid starting out in the hobby, my next kit after trying this one was Tamiya's Me-262...if it weren't for that shake-and-bake kit, I'd probably be done with modeling after struggling with the Black Widow. But at last, my personal dragon is slain! In the words of William Ernest Henley, "Under the bludgeonings of chance, my head is bloody but unbowed." The only problem now is KitMaker's gallery...I keep trying to upload my shots, but keep getting a blank page with "Server busy, try again shortly." That seems to be a system wide problem. I've bumped it upstairs to see if someone can fix it. Nice job on a tough kit, by the way! Well, this isn't the Hanger Queen I started with. But this is where I was at the end of the Aluminum Cans Campaign. Nearly ready for Alclad. 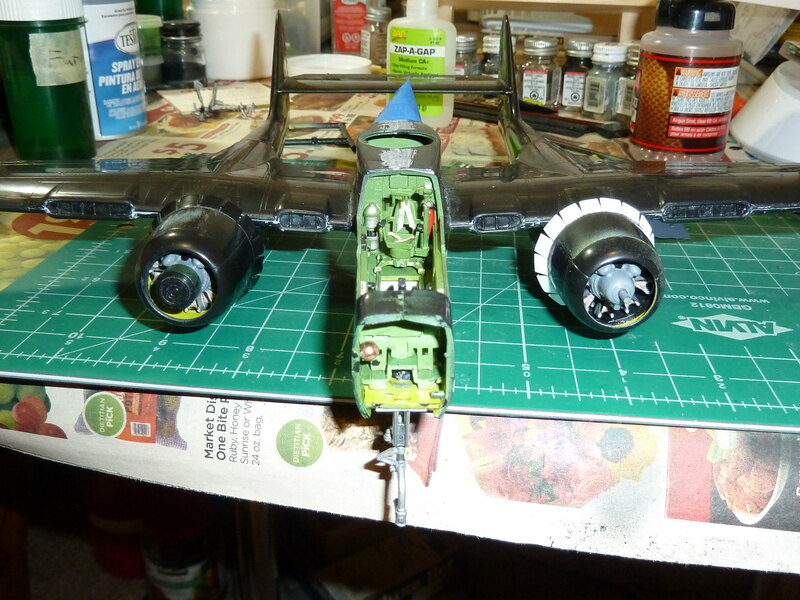 Hopefully I can finish soon and maybe get the original candidate Monogram F8F back into the que. Mark, I was hoping you'd come on over and finish that one up. I think it's pretty good so far, I really want to see what you do with the Alclad! Everyone else seems to puttering along. 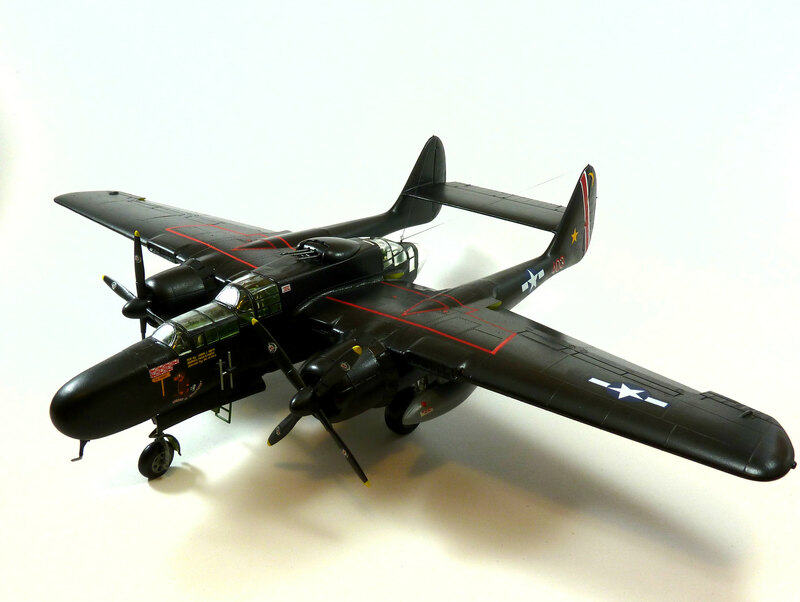 Robby, nice job on the P-61. I'm still slugging it out with the F-16. As suspected the Academy decals aren't worth the decal paper they are printed on. 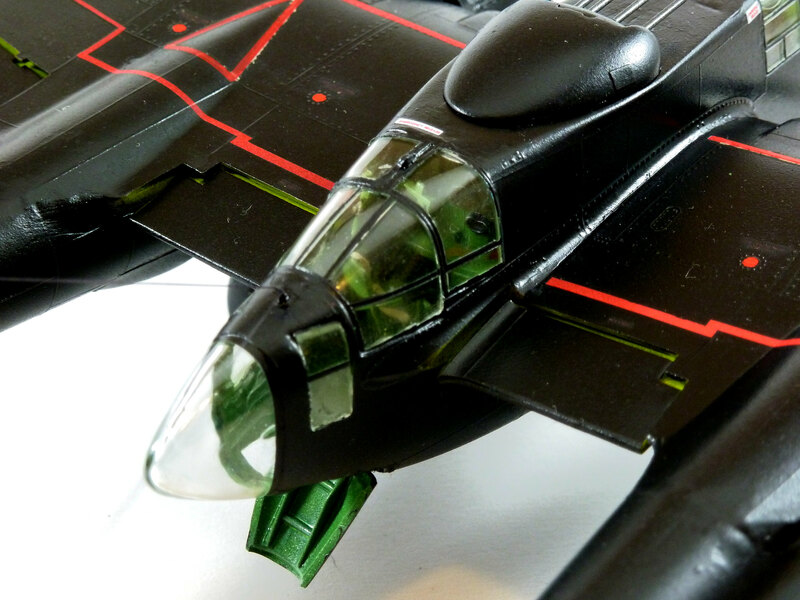 Fortunately, the wing and tail stripes are 6 mm wide, so Tamiya tape will make that part easier. I'm still in a quandary over the thunderbird on the bottom. 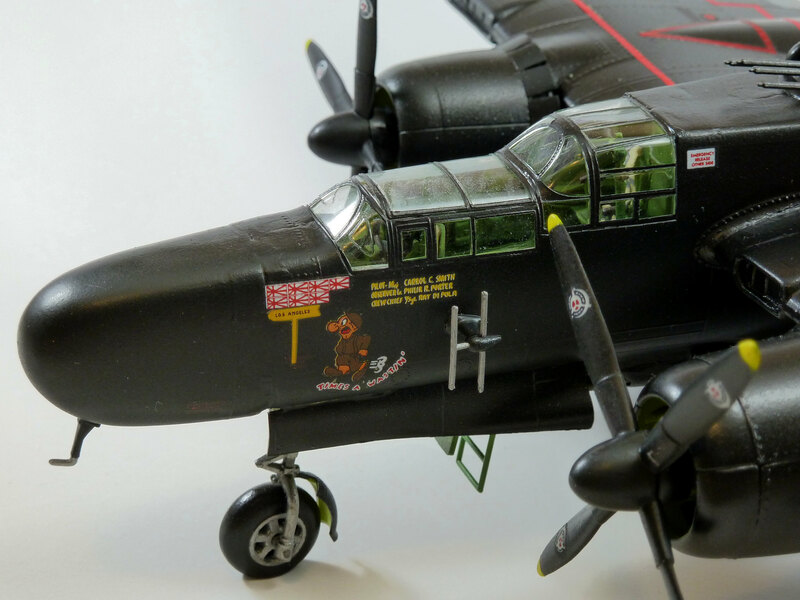 I'm going to give the kit decals a whirl for the forward, wings and tail. I'm thinking some hot water, with some white glue tossed in it. We'll see. I did make a copy of the decals, and if need be I can make masks, though it will be long row to hoe. Got the Alclad on last night, just after I snapped the before picture. Almost a perfect painting experience. No thinning, the paint shot cleanly from the brush, re loaded the funnel with no issues. Did see a few splatters afterwards, but I'm blaming the painter and not the paint. Here is my finished entry for this campaign. 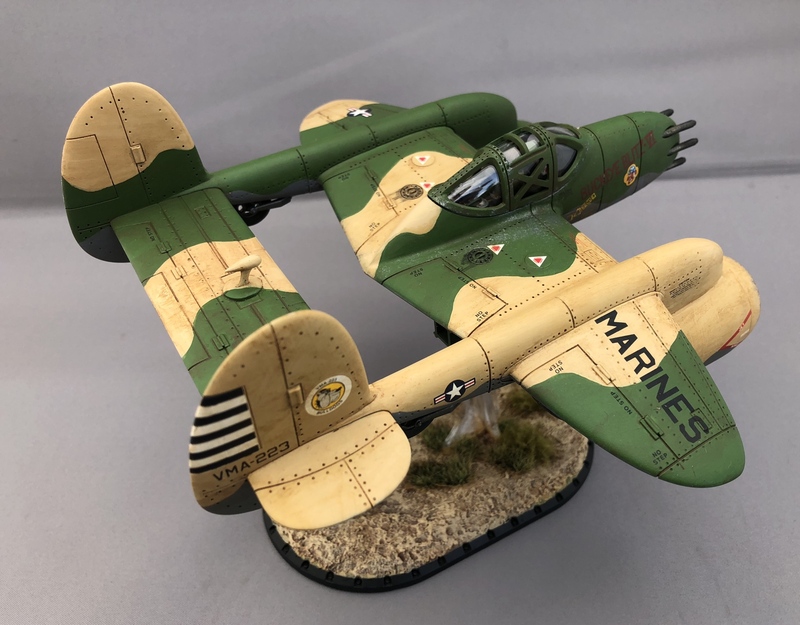 The Dust 1947 Pelican fighter bomber. 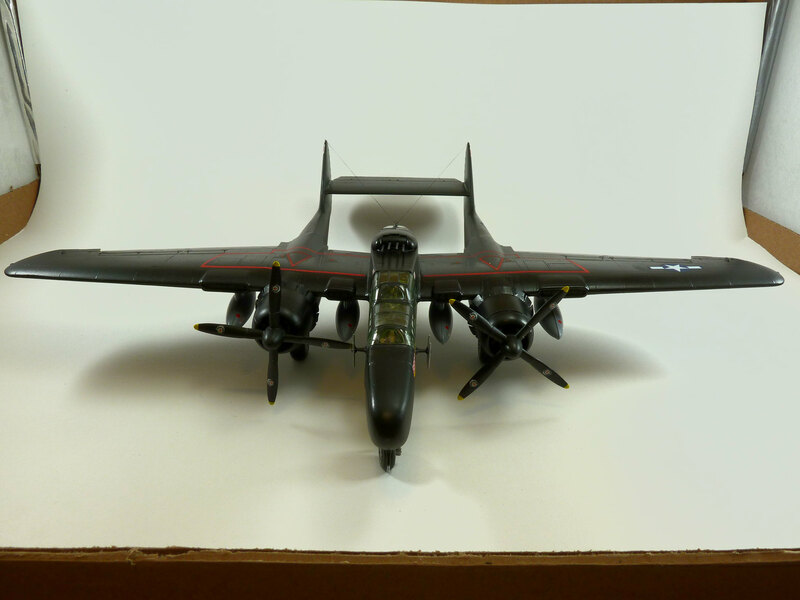 It is roughly 1/48 scale. Great campaign and I am looking forward to see more super entries. Jesper, nice finish! 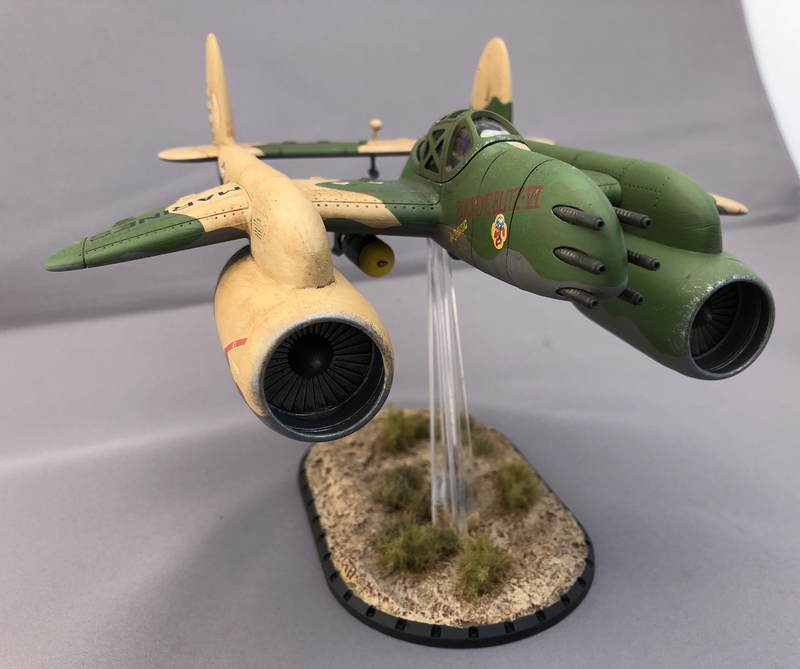 A most unusual model, I like the way you did it! Plus decals that stayed in place and didn't silver. Very nicely done. Speaking of decals, I've continued on with my slug fest. I painted the wing stripes on, an easy thing. Then used the kit's decals for those that would be pretty hard to mask and paint. Not so easy! Academy isn't known for their decals, and these are no surprise. I added a few drops of white glue to water that I soaked them in, then followed with some Micro Sol. After that I sealed the deal with Future. I got them to lay down, but not very well. There will be follow up work, needing sanding and repainting. Still better than doing them with masks. Now on to match the blue, which on the decals isn't insignia blue. Ai yo! Not to give anyone grief, but we're almost 3/4ths of way through the year. So, those of us that haven't completed our queen, it's time to move them off the back burner! So it seems that all's quiet on the Hangar Queen front. Hopefully, we'll see a flurry of activity in the next two months! 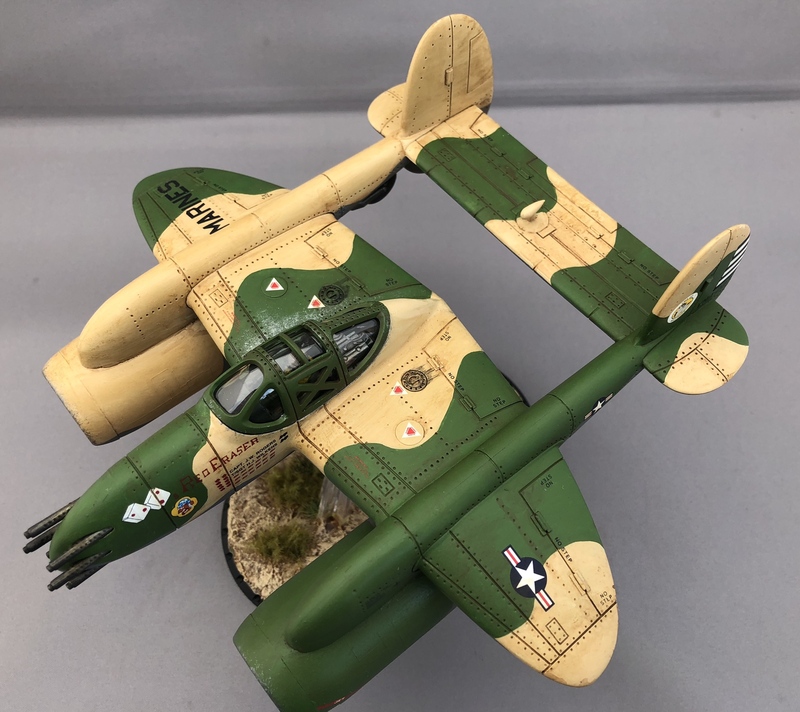 I'm a bit stunned that this build has zapped most modeling enthusiasm points from be, but I'm over the hurdle and it's not hit the wall! It was aimed 3 times, once I even figured trajectories! It seems to look like the pictures, and I'll be glossing it yet again to do touch up painting, now that the colors have been determined and mixed. Ai yo! Michael, if nobody wants it, I'll host next years rendition as well, since I apparently will only get one of five done this year. Unless, Mark wants it! We seem to be the King's of Queens! For the record, I really am enjoying this, and hope that more show towards year end! For those on the fence, now is the time to say Yes! to Hangar Queen 8!! Looking good! I'll be happy to let you take Hanger Queen 9 as well unless Mark or someone else wants to put up a fight. I think you're doing a great job!